In Dubai, UAE steam cleaning is the most commonly-used cleaning method for carpets, rugs, mattresses and many more. All cleaning methods are not equal; results from each cleaning method are directly and indirectly affected by different factors which may include humidity level, presence of children and pets, etc. If you want to maintain cleanliness and healthy indoor living environment, This is probably the only choice. Steam cleaning can easily pierce those pores and reach embedded dirt. Various Cleaning companies in Dubai use old carpet cleaning machines. 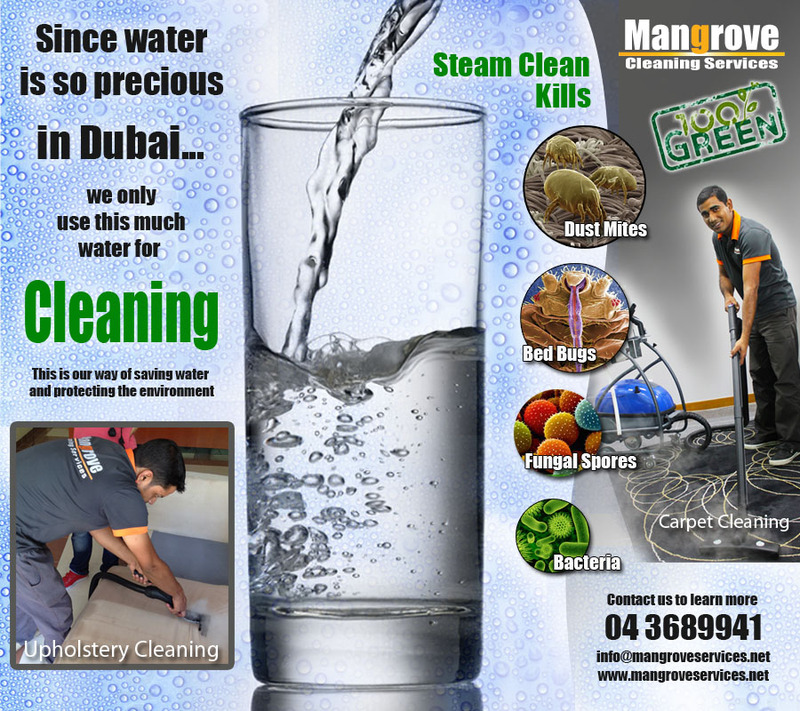 At Mangrove we use State of the Art Steam Cleaning Equipment as par to our regular cleaning process. The process is highly effective in removing grease buildup. Hot steam vapors enter the pores of materials and surfaces that needs to be cleaned. In this way, it cleans more thoroughly, and it can be done without the use of chemicals. It is beneficial in killing germs, bacteria and other microorganisms. By this process can easily clean your floor and tiles up to perfection. After going through that effective process, you will have no streaks or dirt left behind. It can remove all mold buildup from grout in tiles. Though, overtime, grout can be damaged, and you will have to face difficulty in cleaning the grout properly. This is also very helpful for cleaning kitchen units. This deep cleaning method is more effective than using harsh chemicals. Science has also proved that steam cleaning is much more hygienic than using chemicals. Easily restore drains to operate properly. Clean floors, walls and ceilings. 1: Approximately all carpet, rug manufacturers and fiber producers choose steam cleaning for any soil problem. 2: Steam is the cost effective and is not dangerous for children and pets. You can easily clean a surface as water vapors leaves no marks. 3: This cleaning method adds comparatively healthier indoor environment by extracting soils, pollutants and other sources of bacteria. 4: This cleaning method doesn’t need isolating or closing off rooms during or after this process. 5: It is proven that steam cleaning is totally safe and very high temperature steams do not harm fabrics. It includes powerful vacuum suction that removes pet odor from carpets and rugs. 6: Steam cleaning is environment friendly as compared to dry cleaning. It also maintains the color and texture of the cleaned object.